A tummy tuck is a very efficient operation, its successful outcome will give the patient much needed relief. Most often a tummy tuck is performed for aesthetic reasons, but there are also a number of medical indications. In these cases the health insurance company pays the costs of the operation. Depending on the amount of excess skin and the degree of sagging the abdominoplasty can be performed in different ways and with/without additional measures. There are three major types of procedures: the mini-abdominoplasty, medi-abdominoplasty and maxi-abdominoplasty, also known as “classical abdominoplasty” which differ considerably. Most often, the maxi-abdominoplasty is performed because it is very effective and the majority of patients require substantial improvement. During the operation the skin is lifted from the lower abdomen to the rib cage and tightened down, the resulting excess tissue is then removed. An important and often necessary adjunct to the tummy tuck is the correction of the rectus diastase. This means the reunification of the separated inner edges of the two rectus muscles which often occurs after pregnancy. 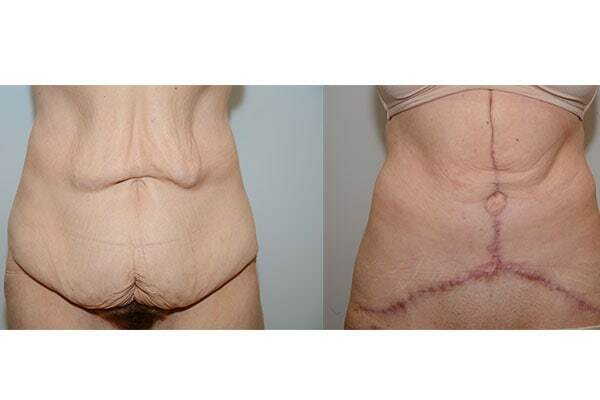 To emphasize the waist, other complementary measures such as suturing the muscle fascia and additional removal of excess skin, can be performed by means of a vertical skin incision. An accompanying liposuction can also help to improve the overall results. A tummy tuck should (especially if the correction of a rectus diastase is planned) be carried out only after completion of family planning and/or achievement of your desired weight which can be maintained. Here you can see some examples of tummy tightening. For most patients, a tightening of the rectus sheath has been performed. The inner edges of the two straight abdominal muscles ( rectus diastase ) which have separated are united together again. The rectus diastase often occurs after pregnancy or when overweight or obese. 1. What happens during a tummy tuck (abdominoplasty)? In the area of the abdomen, excess skin and the underlying fat is removed. Access is via a horizontal incision on the lower abdomen, which can be optionally supplemented by a vertical incision, if an emphasis on the waist is necessary. 2. Where is the tummy tuck scar? The most frequent incision is curved downwards from the iliac crest to iliac crest along the pubic bone. However, underwear wearing habits can be taken into account as other incision sites are possible. 3. What happens to the navel during a tummy tuck? The umbilicus is detached from its original position and, after removal of excess skin, positioned at the same level in the abdominal area. Care should be taken on keeping an attractive shape (longitudinal oval) and a moderate depper level. 4. What is meant by the term “Diastasis”? Diastasis refers to the separation of the paired straight abdominal muscle (rectus abdominis). A Diastasis arises often in women because of pregnancy and in men with massive weight gain. The Diastasis is shown by a more or less broad and clearly palpable gap in the middle of the abdominal muscle when strained. 5. How is a Diastasis corrected? The separated inner sections of the straight abdominal muscle are sewn together. The technical term for this maneuver is called a “gathering of the rectus sheath”. Afterwards, carrying a weight over 5kg should be avoided for a period of three months and a supporting corset be worn. 6. Am I a good candidate for a tummy tuck? Basically only physically healthy people should be operated on. Furthermore, in women, family planning should be completed because a pregnancy can worsen the result of a tummy tuck. Heavy weight fluctuations also jeopardize the outcome, so the procedure should be carried out when the body weight can be maintained after the operation. 7. Can stretch marks be removed with a tummy tuck? Yes, but only those found on the excess skin. Stretch marks that are above the navel region, unfortunately, cannot be removed, but they are moved much further down, so the appearance is improved in any case. 8. When does the insurance company cover the procedure? If the procedure is medically necessary, that is, if there is a massive fat apron after significant weight loss, intertrigo (soreness), pronounced Diastasis (from 5cm) or abdominal wall hernias, the insurance company will cover the cost of the procedure. 9. How many nights can I expect to stay in the hospital? In general, two nights should be sufficient. However, in some cases three or four nights of hospitalization may be necessary. In mild cases, especially if no gathering of the rectus sheath was necessary, you may be able to leave the hospital after one night. The most common medical complications are – due to the large surgical area – bleeding, infection and impaired healing. Aestheical complications may include: unfavorable or asymmetric scarring, distortion of the navel, pulling of the sutures, step formation of the tissue above the pubic region, dog-ear formation and keloids. With careful work however medical complications are very rare, the occurrence of aesthecial complications depends on the experience of the surgeon. 11. How long after the procedure can I resume normal activity? After about 10 days, if only the excess skin was removed. If the rectus sheath was gathered, depending on the individual, it could take one to two weeks longer. Exercise, coupled with a tightening of the abdominal muscles must be avoided for a period of three months. 12. What are the long-term results after a tummy tuck? If the patient suceeds avoiding major fluctuations in weight, the result is permanent. 13. Can liposuction replace a tummy tuck? No. 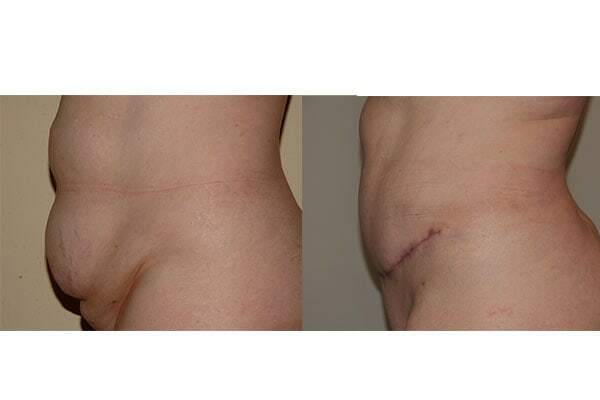 Liposuction reduces only the fat volume and can not achieve the necessary tightening of the abdomen. However, liposuction can be used to improve the overall results, as an accompanying measure. If you purchase the Enzyklopaedia Aesthetica book “Bauchdeckenstraffung & Bodylift” (Tummy Tuck & Bodylift) ( EUR 34.90 ) the first consultation is free of charge! You can purchase the book during your first visit in the ordination or order it online. Blood lab, ultrasound and X-ray are no additional cost if you are insured in Austria. The same applies to the OP-release by an internist or general practitioner, who are under contract with the usual social security institutions in Austria. In our medical center, there is an internist that the insurance considers a physician of choice. In this case, the insurance will cover about 50% of the cost. The operation is performed under general anesthesia therefore an anesthesiologist is needed for surgery. The cost of the anesthesiologist may vary depending on the duration of the operation. The cost is between EUR 400-1200. The average cost is around EUR 600-800. Depending on the duration of the surgery and the accompanying supplementary measures, the surgical fee is EUR 4.500 – 7.500. A tummy tuck is performed in principle in an ISO-certified operating room of a hospital. For a period of 14 days before the operation, anticoagulants (aspirin, Marcoumar, vitamin E, etc.) should be avoided as this can delay blood clotting. Also alcohol and sleeping pills should be avoided as far as possible, because they reduce the coagulating ability of the blood and thus increase the risk of bleeding. The consumption of cigarettes should be reduced to a minimum as much as possible. Nicotine has a vasoconstrictive effect, which can lead to impaired wound healing, especially with a tummy tuck. Furthermore, one to two days before the procedure, food intake should be reduced to a minimum and the intestines should be emptied by taking laxatives. This measure is primarily done if a correction of a rectus diastase is planned in order to make sure that the reduced abdominal girth is more easily tolerated by the patient. For the smooth processing of admission, please arrive at the hospital at least 2 ½ hours BEFORE the surgery and be six hours sober at the time of surgery. After completing the admission formalities you will be placed in your room. At your request, you will receive an infusion which reduces your thirst. With a tummy tuck, a hospital stay between one to three nights is to be expected. At home, relaxation and recovery should be in order. Avoid strenuous activities, especially when a gathering of the rectus sheath was performed.